Here is a cool classic ad from the late nineties. This one is for the 1999 Yamaha motocross lineup and features Jeremy McGrath, John Dowd, Doug Henry and Kevin Windham. At this time, Doug Henry, John Dowd and Jeremy McGrath were all coming off of championship seasons and Yamaha was making a major push with really great bikes and advanced technology. 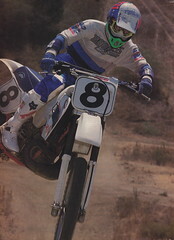 The 1999 season marked the second one for the revolutionary YZ400F four-stroke, a bike Doug Henry had piloted to the 250 National Motocross title the year before. In the 250 class, the YZ250 would see its first major engine redesign in over a decade and in the 125 class, the YZ125 would continue its dominance with the most powerful motor in the class. What really makes this ad interesting though, is the presence of Kevin Windham. If you were around in 1999, you will remember that Windham actually ended up breaking his contract with Yamaha and switched to Factory Honda for the ’99 season. In the lawsuit that resulted from this breach of contract, this ad was mentioned as one of the sources of damage done to Yamaha’s corporate image. Controversy aside, you have to love some of these high-concept ads Yamaha was producing during the nineties. compared to the boring drivel we get today, this stuff was practically Clio-worthy. Now, you are lucky to get a tiny photo of a bike and maybe a one page spread at best. In the nineties, print media was still king and a nice five or six-page spread was not uncommon. Damn, I miss these days.